I love creating things with my sewing machine, unfortunately it's not always smooth sailing. I am convinced that my sewing machine hates me. When I was a little girl, my mother told me that I was very mechanical, "You definitely take after your dad!" That was a huge compliment, since my dad could fix just about anything. Well, like most people, when he was motivated to do so. I remember admiring his tools in the garage on a regular basis, tiny drawers full of washers and screws, a peg wall that held hand saws and his favorite sign. My brother and I would play for hours at that workbench, pretending and creating, making a mess more often than not. However, the in the process of play, as is often the case, I learned. By the time I was eight or ten, if the vacuum stopped working during Saturday morning chores, I grabbed a flashlight and screwdriver and got to work, replacing the belt or the fuse. It was way more fun than the vacuuming I had been assigned and when it powered up, there was fabulous sense of accomplishment. If a lightbulb burned out in the makeup mirror, I was on it, if the radio or the tv quit, I was the troubleshooter. I began to search the house for broken items, so I could fix them. I learned how to improvise and make up parts for things when I couldn't find what I needed. My curiosity was always pushing me. I wanted to know how things worked, what made the car go, and stop, how and where the gas and water mains were and what to do when brake light in my car went out. By the time I headed off to college, I could change a flat tire on my own...and did, at night on the side of a very dark and winding road, while my guy friends stood around, explaining that they couldn't help me because of shoulder pain or the fact that they were wearing a new shirt. I remember calling my husband, who was just a friend at the time, to tell him the story and he responded by telling me that it sounded like a bunch of excuses, that those guys had no idea how to do it. No matter, I was happy that I had the skills. Cars, home appliances big and small, the pool pump, cell phones...as long as it didn't involve power tools, I could fix them all. Well, except for the sewing machine. For some reason, my sewing machine hates me and I cannot for the life of me figure out why. Every single time I thread it up and get ready to sew, there's a problem. There's a jam or a tangle or a slip or a break. Every single time. There's never been an exception. It should be so simple ~ thread, push and go. Adding this zipper was easy. Wrestling with my machine was not. I don't have some fancy electronic model and I am not into complicated stitching projects, I'm generally looking to sew a simple straight (well, straight-ish) line, but it never, ever works out that way. I begin each session with optimism. I greet the machine with a smile and some pleasant conversation. I tell it what I am hoping to do and I ask for a little help and cooperation. I let it know that I am willing to let bygones be bygones, and I would really love it if we could just be friends. But that machine hates me, so we barely get started before a fight breaks out. I try to be patient and kind. I speak in my best kindergarten teacher voice, whispering in hopes that the argument doesn't escalate. Then the flashlight comes out and the oil and the new needles. I untangle and unjam, rip out messy seams and start over and over until I am literally ready to throw the project and that machine right out the window. My scrap fabric banner was another 'this should be quick project'...my machine had other ideas. I know, I know, I should probably take it to a professional at this point (or have my husband look at it), but after all these years, it's become personal. I don't think counseling is going to help. It's a fight to the finish and I want to win. It's very hard to get a Sicilian girl to give up. No. I struggle through every inch of my seams. Somehow, I manage to force that disobedient sucker into submission just long enough to finish up and then I condemn it, back to the basement, with some very choice words. Most of them Italian. Camouflaged curse words sound way better...and don't get me into trouble with the kids. 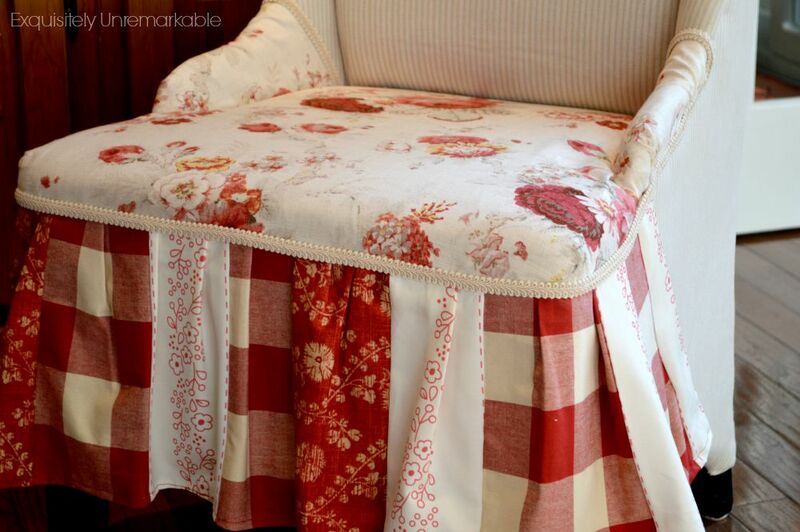 If I had used glue on this skirt, this whole chair would've been no sew and no machine! I'll never learn. ...only to get bitten again. I guess my machine has a better memory than I do. So who has tips for me? I'm all ears! When I can I avoid sewing. Here are a few hand stitched and no sew projects...no fighting involved!! I realize this was a post that is about frustration but I can't resist offering some advice, all learned after lots of frustration. I discovered years ago that quality thread and machine needles made a huge difference in how my machine behaved. I would also add that using bobbins made specifically for the brand of machine I have as well as regularly brushing out the lint fuzzies around the bobbin also helps. I don't fiddle with the little screw on the bobbin case to adjust tension and only adjust the upper tension. A sewing machine is not simply a machine. Sometimes it is the other part of the machine that is going awry, such as the thread. 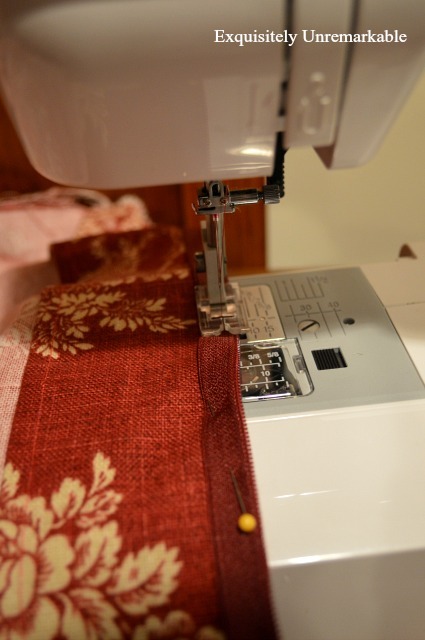 when I switched to serger thread and a topstitch needle a lot of my problems went away and my machine was happy. Or maybe your machine is haunted by its previous owner. Ah hah!! Now I know why I like you and your writing so much . . . you're Sicilian! Me too! And what a great take away it is!! I bet we have much in common, Kathy! I have had the same love/hate relationship with my sewing machine too! I spent years fighting that thing just trying to sew simple things then one day I was fighting another tangle of thread and realized I had been threading it wrong all that time! Since then I haven't had any problems with the machine. I still can't believe I never noticed for all that time. I have to get my manual out, Pam and check on that. You are not the first person to suggest that and now I am wondering if perhaps I have been doing it wrong all this time too. Hmmm....off to check. Thanks for the tip!! Some advice my mom gave to me a few years ago, when I was having a similar battle. She told me that the quality of thread and needles is very important. I now purchase Gutermann thread. I have been pleased with the thread and my machine must be smiling too. We do not fight as much. As always, Kim, fun post! Thanks Carla! Quite a few commenters are sharing the same advice, so it must be true! I am off to buy some better thread as I have a sewing project coming up. Wish me luck. It's such a shame, Sue, since it should be so simple...I hope one day she meets a more agreeable machine! I have had moments like this as well. "my sewing session will run smoothly." Never runs smoothly . . . I get the bobbin twists too . . .
stitching messes up . . .
Not any Sicilian blood in me . . . I am sure. That's how I feel, Lynne...I just want to avoid sewing altogether since it always turns into a frustrating experience. My husband (and dad) always said, with the right tools, any job can be a breeze. Obviously, the opposite is also true!! (against my advice). It acted as though it had a deep seated hatred for her as well, lol! No amount of good thread, good needles and sweet talking made the machine sew any better! It snarled thread, snarled bobbin thread, broke needles and sewed snarled seams. Sometimes you just can't make a subpar machine operate like a good one. I have a Bernina, that I purchvased used, that's over 30 years old. It sews beautifully and never fights with​ me.....we work as a team instead. I also have a 1956 Singer, a 1963 Singer and a 1966 White.....all of which sew beautifully with no fuss or trouble. All this to say, sometimes it's the machine, not the operator..... no matter how mechanically inclined she is! I agree with you, Kim. If a machine is poor quality, then there is no winning the war, I suppose. I have a Kenmore machine now. I bought it for about $100 several years ago. It is a very basic model, but I have never been able to get it to behave. I grew up with a Singer and we were actually very good friends! 😉 Thanks for all the input. Definitely food for thought!! Girl, you make me laugh! I'm sure there just has to be a bit of Sicilian in that little Even though you struggle you manage to make so many pretties. That chair being my all time favorite! Thanks Jann! Making people laugh is my favorite thing to do!! Interesting! 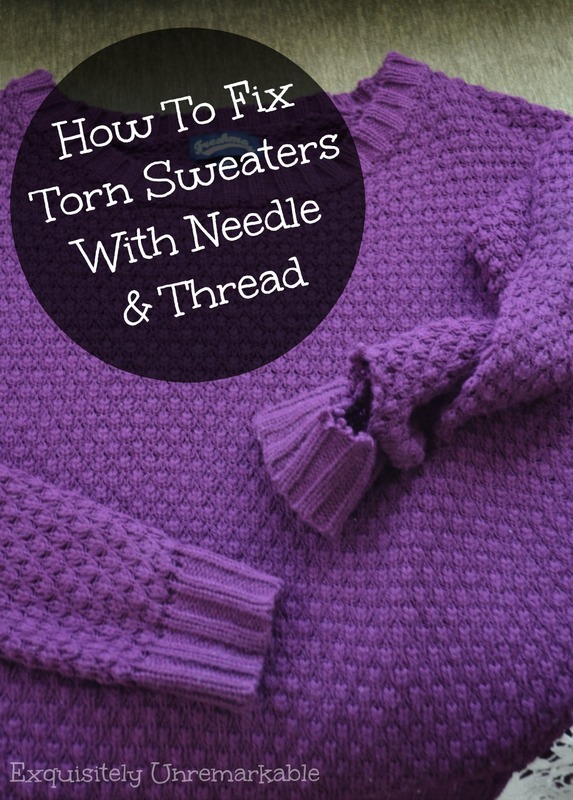 Some have told you to use certain expensive threads and needles. I use whatever is cheapest and they work just fine. One thing you may want to check is correct needle threading and correct threading of the bobbin. Now, on to another suggestion and a comment about cheap Brother machines from Walmart. I sew on vintage machines, 1938, 1960, 1978, 1950 and so on. I have twelve machines. I have never paid more than $30.00 for any of them and the great part is that I can fix them myself, since they have very simple mechanics. They also give the most perfect straight stitch every time. As for the Walmart Brother ($99.00) I purchased last year to take to Florida to take care of my father after he broke his hip. It is a joy to use, nice stitches and lightweight. No complaints at all, but I still prefer my vintage machines (Universal, Singers, Kenmores, Morse, White.) Check that threading of needle and BOBBIN. It just might be the problem. Good luck. I love vintage machines. I see them all the time and have often thought about getting one. I honestly think that you are right and that my problem has a lot to do with operator error. I have a very basic Kenmore machine. I have never been formally trained and while I am very mechanical, I do believe that there are nuances regarding needle and bobbin threading, thread tension, and other settings, that I am just not well versed in. Instead of fighting, perhaps I should take a class (or read the manual) and try again! Thanks so much for the advice and the input. A Brother's from Walmart that works well? I may have to revise my opinion of them. The friend I referred to bought a Singer from Walmart and it worked so poorly that she got rid of it in three months time. I know a couple of people who repair sewing machines and their advice is to buy an older machine from the mid60s or older. Metal bodies, metal gears, simple to operate. I bought my son a heavy duty White machine a few years back when JoAnn's was discontinuing the line in their stores. Son was happy to have it but says it doesn't hold a candle to "Bernie", lol! Your point about the older mechanical models being easy to maintain and repair yourself is one of the reasons I love the older mechanical models myself. I've watched my cousin upgrade for over three decades to fancier and fancier machines.....and spending more and more time schlepping them to the repair shop. Expensive repairs and they tend to be in the shop for an average of three weeks. She ends up borrowing one of my non computerized, non-fancy, old school vintage machines while hers is in the shop. She finally took back her mom's 1960s era Singer from her sister (who wasn't using it) so she has a permanent standby! I'm not saying fancy machines are bad, I just don't want one for myself. As to the idea that threading could be an issue, that's so true. I have one older machine that was giving me fits until I realized that I was threading the needle right to left instead of left to right. It was my first experience, many years ago, with a machine that had the eye of the needle facing sideways instead of front to back. 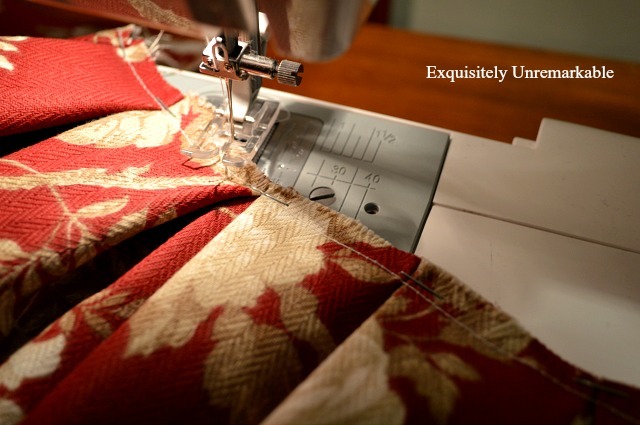 Your sewing story is my story. Why, just why is it so hard to thread the bobbin? Oh, Kim, I can so relate! I have the same issue with my sewing machine! It has been relegated to sitting on the floor under it's cabinet!! I have given up the fight. It has been 48 years (!!) after all. I am sorry that I have no advice for you, just sympathy!! Oh Kim I wish I could help you out the sewing but I'm not a sewer. :( Good luck with the sewing problem. Got a word of advice for you. Get yourself a Singer Featherweight from the forties or fifties. Those are really simple, made extremely well. Once a sewing machine store owner told me that they would far outlast those made in the past 40 or so years. They are pretty indestructible. I'm Irish and I think our sewing machines might be related. I also have a Brothers and at times I want to scream. I went on YouTube and that helped a lot and I haven't threatened it lately (of course I haven't used it lately). I just keep telling myself that this too shall pass. I hope it does for you too. As you know, I don't know the first thing about sewing machines, so I'm no help. :) I do have to say though, that I'm very impressed with your drive and determination to fix things! You go, girl! I've been sewing for 54 years ( recently on a brand new machine) and at least once, usually more often, I have issues. It's not you! I'd also pay attention to getting the tread through the tension portion correct. I have a simple singer that is futzy about that. There are metal disks just behind the tension knob. It's easy to get the thread into the wrong slot. I agree with those who said to use decent thread, that does make a difference. Great tips, Pat, thank you. I will check for the disks and make sure I have that set properly. I appreciate the input, I really would like to get along with the machine and just sew!! I am VERY thankful to read this post....but it's backwards thankful!! My machine is 50 years old, and has been used every day or three for all of those 50 years. It will do everything for me except cook supper!! My only suggestions would be the same ones you have already received...I will only use Gutermann thread, Singer needles (my machine is Not a Singer though), and long quilters pins. You might run your fingertip along the thread race to see if by chance there is a burr. Sometimes burrs show up after you catch a pin with the needle. If you find one, just buff it gently with a soft nail board. Also, you might check under the little flap that controls the bobbin thread in the bobbin case. Sometimes a bit of fluff gets in there and causes havoc. The last hint from my storehouse, is check your needle to see if it is completely seated. 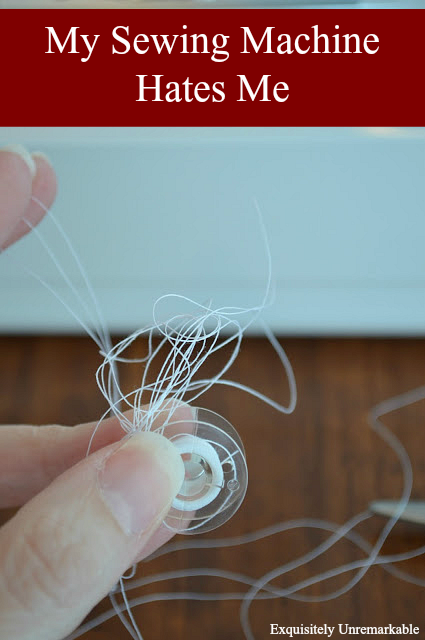 The way the bobbin looks, the needle could be the cause of your problem. If it is the least bit cockeyed or not completely in place, it will do that to a bobbin. Thanks so much, J and boy oh boy, from all the comments and emails I have received, you are a lucky lady. It seems like there are a lot of misbehaving machines out there. I will try your tips, including the Singer needles. Thread seems to play a big factor from what everyone says, Gutermann being the brand of choice. And wouldn’t it be nice if a Red band needle was the cure!! Ha!! I have my mums 40 0year old Bernina which I love. I do however get it serviced regularly which helps it behave. Have you ever had your machine serviced that might help. My mom had a sewing machine in our basement when we were growing up, and she was amazing, could make anything!!! I tried so hard to learn how to use that machine, and every single time I tried, I ended up with a giant wad of tangled thread. The idea of buying one has crossed my mind from time to time, and then I remember how much I hated that darned machine and I put it right out of my mind again! I have a couple of wingback chairs I bought to thrift store and I don't know if I'm brace enough to reupholster them. Haha yours looks amazing!!! Thanks Janice! I say go for it! It was seriously just ironing and gluing...you can leave the sewing out completely if you choose. Keep me posted if you do give it a try and good luck! It may not be you at all and I have a story to share to make the point... I am a quilter, I have been sewing since I was about 5 years old. I love to sew, quilt...until my dear husband gave me the gift of choosing a brand new sewing machine, whatever I wanted. Oh, was I excited! I researched and visited all the different shops and tried all the brands and finally made a decision. I could hardly wait to get home to try it. Now, I am not much of a bad words girl, but this was about to change. That machine was horrible! I spent the next 9 months swearing at it, yelling at it, and the car knew the route, by memory, between our home and that stupid sewing shop. They would say it is all fixed, perform a little demo, and it wouldn't work still. Finally in total frustration (and for the shame of my filthy sewing mouth) I put it back in the box that it came in, put it on the shelf in the back bedroom and planned on never setting eyes on that machine again. After a few hours I got more and more frustrated because my dear husband had spent several thousand dollars on that piece of manure so I sat down and wrote my tale of woe to the store owner. There are still good people in the world, within 4 hours, I got a phone call from the store and they gave me back all the money we spent on the machine (and I was elated to deliver that machine back to where it came from). Since then I have purchased another quilting machine and it is absolutely awesome. No more bad words from this girl (OK, well once in a great while. lol). I don't know what happened to the machine that I had when I was in high school but the one that replaced it was not nearly as well made. I read with interest the comments about Walmart machine. My uncle used to tell me that power tools made for Walmart might have plastic instead of metal parts. He also said that the boxes were identified with a letter at the end of the model number on the box and that the boxes made for sale at the lumber yard or the hardware store had the same kind of model number but without the letter at the end. I have no idea if that is similar for sewing machines. I have similar issues, not all the time but often enough to be frustrating. My biggest issue is difficulty threading the needle due to poor eyesight. Those machines with the self threading features are very tempting. My projects are starting to pile up. I want to do them I just don't want to start them. But I will. Someday. Maybe that's what I need, Lorri, a self threading machine. Everyone keeps commenting that if the machine is not threaded properly, there will be problems. I *think* I'm doing it right, but then again, maybe not. I really need to dig in and figure it out. I don't know what happened to the Singer I grew up with either. It was a fabulous machine. And Walmart, yes, I have heard about the plastic parts...boo. It's so frustrating, Ronda. I admit, it very well could be user error, but it does not make for a fun experience. I will try the thread...seems to be a common recommendation. I would love an easy fix!! Thank for the tip! Hummm. It seems our machines are related. I use to love to sew. My greatest feat was to make three dresses for my sister in one day. Time passed, and I went on a search for a new portable machine in case I took a real class. I saw machines from $29 to the Bernina and decided I should not pay more for a machine than a used car. I bought an all metal German model just like my old cabinet model. The misery started because it threated backwards from my old machine. The bird's next followed. Went back to the shop and was told I needed to buy better thread. It would work fine in the shop and once I got home, bird's nest again. For fifteen years that machine has been in the carrier by the door, hoping to find some miracle worker who could make it work. I don't sew anymore. Maybe I need a kid's machine that will sew straight seams for my little projects. Perhaps we should give up and buy new machines. A side story. A father and son owned the sewing machine shop where I got mine for many years. He told me a story about having to lock the dumpster because when they put the junkers they couldn't repair in it, someone would steal them to sell at a flea market down the street. People would buy them and bring the same machines back to them to repair. I have no such excuse because mine came new in the box from them. You and I have the same luck or the same old naughty machine! I have a table runner that is waiting to be sewn and I am afraid of my sewing machine! I have some valances to hem and I am afraid too, Jemma!! I would like to get it done before the fall season comes along and I don't need my summer curtains anymore, but I just don't have the nerve. I wish you luck with your own naughty machine!! I have a Brother I bought at Wal-Mart over 30 years ago and it's never given me a bit of trouble. I clean it regularly, oil it, and use good thread and needles. It gets a good work out, too. Good luck with figuring out the bobbin issue with the machine. By the way, I had a Kenmore early in my marriage and I hated it. It gave me nothing but trouble with the bobbin thread. Just sayin'. Hugs. That machine makes me so angry, it has taken all the joy out of sewing. I am glad that you and your machine get along well. I may just have to step out of this toxic relationship and move on. I am going in for one more battle with new needles, new thread and a good cleaning. After that, I think it may be a white flag!! Hugs!! I doubt it's you Kim, especially since you've been sewing so long, but just in case give some of these suggestions a try (check manual, good needle/thread) so that you can at least eliminate that possibility. Then, consider trading in your machine. It's true that older machines have less that can go wrong, but I honestly feel it can be the luck of the drawer. I have a kenmore which is basically sitting on the floor being used as a backup. The machine I use is a singer which I purchased a few years ago. It was a limited edition that looks vintage but is new. Very cool machine and is simple to thread and operate. It's not so simple to thread the bobbin, however, but just a few days ago I found a rather unconventional way to do it...just hold the thread with my hand while it goes around the bobbin! It worked! 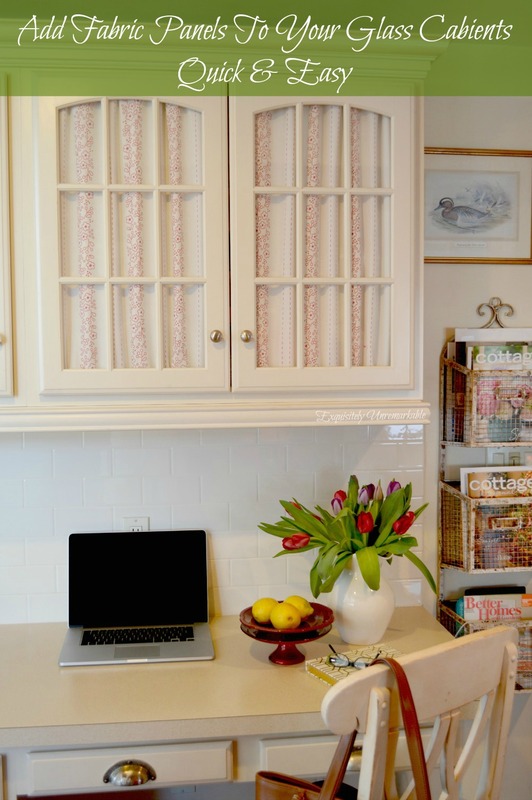 Now, it's quite a coincidence that you wrote this post, as I was thinking of doing one about my serger (but I probably won't). It is a necchi, and has given me issues since day one many years ago. I did in fact write a post about THAT lol. It has always scared me, and rightfully so. I decided to try it again last week and was happy to see it was working well, then it just stopped. Nothing jammed, nothing broke, it just wasn't creating seams. Looked at YouTube and did what was suggested, but I'm sure I made it worse. I just finished looking up repair shops that I can take it to today, but am considering trading it in for something simpler. Sometimes fancy and expensive is overrated, particularly if all you need is basic sewing. I agree, Doreen, simple is best sometimes...and trust me, mine is pretty basic, but apparently there is still enough technology there to cause a tangle. I would love to get a serger, but I have never really enjoyed sewing enough to move on to the next step. I bet though, if I had a less troublesome machine, I would have fun with projects and want to take my skill set further. Right now, I am cursing and aggravated and sweating by the end of a simple straight valance stitch that I can't wait to be done with the project. I am getting ready to throw in the towel with this one. Thanks for the comment...good food for thought, may be time to cut ties with this one!! Good luck with your serger! Thanks for the tip and you're in good company, everyone is recommending the old Singers...I should've kept my mom's!! Off to read your post, Deb!! I have to agree with those who suggested getting your machine serviced by a professional. Lots of fabric stores will have people they can recommend, and they are generally very reasonable. I've always sewed a lot....first for my kiddos and myself, making pretty much everything we wore and used a simple little Singer machine. Later on I started a sewing business, making things for the home and pumped up the volume with a Bernina. It was one of the first electronic machines on the market at the time, and at 30+ years is still going strong...it's built like a tank and weighs a ton! I get it professionally serviced every few years, but I do my own maintenance often. I seldom have issues with this machine, but the ones I do have are typically because it needs cleaning (canned air is your best friend...trust me) or I've accidentally used a different thread in the bobbin than the spool on top. Sewing machines really do like consistency between spool and bobbin. Only occasionally is the problem with the lower tension...it's much more finicky than the top tension. The other possibility might be where you store it...if there is any dampness or humidity in the area, that could possibly affect the machine. Wow, now I am completely depleted of all knowledge....sad but true! Good luck! Carol, it sounds like I just need to ship my machine off to you!! I think you could run a repair shop yourself! 🙂I will give your tips a try and keep you posted. There are so many nuances with these machines that I was unaware of. I'd really like to have a trouble free sewing experience. Here's hoping and thanks so much!! I know your pain. Growing up, I can't count the number of my mother's machines I fought with (heaven forbid I even think about using the serger). It got to the point where Mom would stand over me, watching every move, flabbergasted that, despite doing everything exactly like her, the machine seized up in tangles of thread. We'd rip it out and start over, this time with Mom sewing, with no problems. I've resigned myself to the fact that I have to hand stitch everything. My sister seems to sew on my machine without a problem as well. That leaves me to believe that the problem is with me! ;) Although I won't readily admit that...yet!